The Serology Rotator is designed to give years of dependable service, even in the busiest laboratory. It’s the ideal space-saving instrument for procedures that require constant or timed rotation (mixing) such as RPR, VDRL, latex tests and for procedures that require a non-standard speed. WEIGHT LBS - 8.6 lbs. 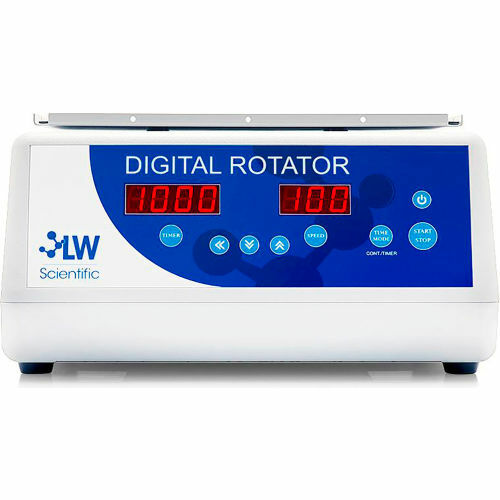 PLATE SIZE - 9" x 9"
Congratulations, you have found descriptions, reviews, prices, and availability for LW Scientific RTL-BLVD-24T1 Digital Rotator. Our crawler software prepared this page for you while searching for "Hot Items in Scientific Products" and related Scientific & Lab Equipment products at Global Industrial. If you have any questions on this product, please give us a call at 734-971-1210 during the hours of 9am - 5pm EST for assistance. Thank you for shopping at Tbook.com, the Internet Department Store!